I found this outside my window the other day. 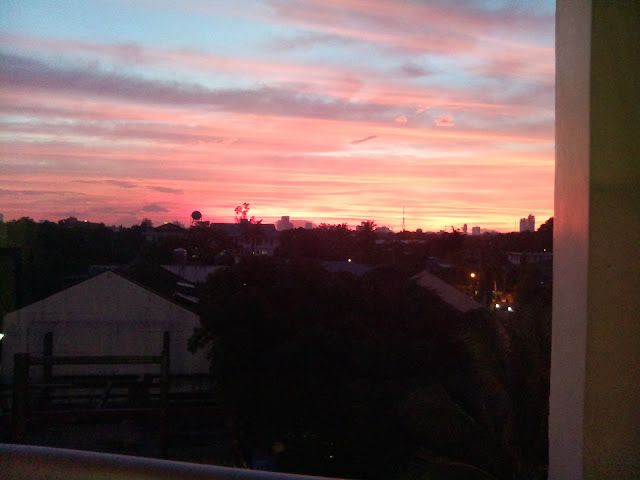 It would have been nice to share the view, to have another set of eyes seeing the spectacle of a pink sunset, but what was there to say? Any word would have trivialized the instant into a mere Wow, which is never sufficient; when was it ever? I was in the company of books, nine books to be specific, but books that I actually liked. It was a big haul and just having it stacked on my table by the window was comforting enough, even though they have yet to be read. There is a quiet kind of affirmation one feels when surrounded by possibilities - the possibilities of new books, new stories, new people. Possibilities of cozying up in a corner with just one train of thought, possibilities of conversations about a line that jumped at him because it made a wrestling reference, which you never realized yourself. It was like getting drunk in the beauty of being alone, of finally seeing a picture of what it's like to have only yourself, of realizing that you are beautiful and exquisite despite people getting tired of you or not believing in you, of looking at a pink sunset and finding yourself in it. I found this outside my window the other day, and it's like the sun telling me: it's going to be okay, and for the first time in a long time, I believed it.